Welcome to my Mary & Martha shop page. I became a consultant for Mary & Martha in the summer of 2014. I have never been the kind of person who likes a hard sell or would be interested in home party type business. I’m not that kind of sales person. 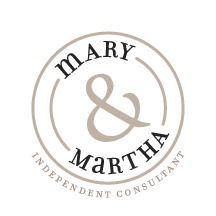 But, when I was approached by another consultant who thought the Mary & Martha product line would marry well with my blog, I was intrigued with the idea. First, I checked out the products myself, because I would never recommend something to a reader of my blog that I wouldn’t have in my own home. The products are a quality that you would expect from the Hallmark/Dayspring family. I only share products here on the blog that I would have in my own home and that fit with my own design style; and I typically only share a couple products a year that are my favorites. I feel if the product is good, it sells itself! Below is the newest Spring 2018 catalog where you can browse the latest products for your home. The newest Spring products will be available to purchase on February 1. If you would like to purchase an item from the catalog, just click HERE to place an online order. Your package will be shipped directly to you without me being a middleman. This makes the entire process easy for both of us and you’ll get your package much quicker this way too! I’ve found Mary and Martha packages to be shipped quickly and securely and most of my orders arrive within a matter of days. If you’d like to learn more about being a consultant for Mary & Martha, feel free to contact me via email at hymnsandverses@gmail.com. I’d love to tell you more about being a consultant.